It’s been a funky few weeks. By funky, I mean a few things. The first is that I spent a week “off” of being sick. In a funk. The second is that I spent the next two weeks-ish elbow deep in felt and needles and thread and “watch instantly” shows on Netflix. This second sort of funky resulted in a felt garland for baby’s room and a few good cries on the couch during shows where someone I didn’t want to die does, or two people I want to be together aren’t, or where two people who you KNOW have been meant to be together FINALLY tell each other how they feel and live happily ever after. You know, the sort of thing my heart would usually just ache for, but during my third trimester of pregnancy induces tears which then cause me to laugh out loud at the fact that I’m crying which makes me cry harder. It’s all very complicated. Funky, even. Oh, and did I mention I finished a quiet book? Anyone who reads this blog (or even just this post, for that matter) knows I’m a crazy person. One of my crazy habits is that I LOVE hand-sewing with felt. Don’t ask me why–I just find it relaxing and satisfying. I’ve made a few of these before, but it was really fun to make one FOR MY OWN BABY. Which page is your favorite? I can’t get enough of that owl page. I love it! Update: Thank you to everyone who has asked if I have a pattern. I didn’t use or make one. I sketched it out on paper, then traced onto the felt before cutting. HOW CUTE!!! I wish I had the talent AND the time to pull something like this together, it is so cute! I have a thing for owls, that page has to be my favorite! Oh, they are ALL my favorite!!! Of course I’m partial to the lion, the alligator, the frog and the fish–but the addition of the owl and monkey are adorable! I feel for your third-trimester tears–I regularly found myself crying at commercials (from which, of course, you are mercifully spared by Netflix)! Ah, the joys. We can’t wait to welcome your sweet baby girl! I love the lion page!! So colorful and so many ribbons. 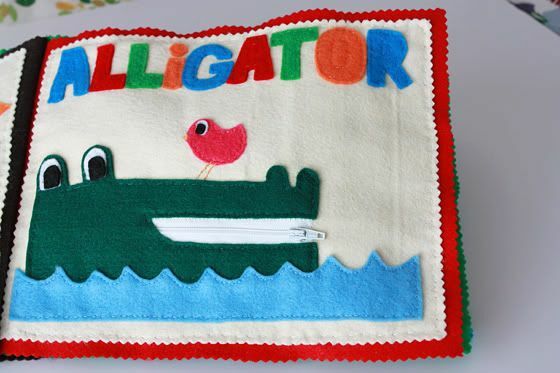 I am jealous of your awesome talent, I don’t really know how to hand sew very well, and I don’t know how to work with felt at all. Why don’t we live closer right now!? Oh, and I am the same way with shows sometimes. While I was catching up on Psych (do you watch that show?) I was in complete agony every episode wanting Shawn and Juliet to get together. And I’ve been watching Scrubs (not the best, but still gets a laugh sometimes) and whenever somebody dies in the hospital I get so choked up! That really gets me. This is awesome! I have a 21 month old and have been working on an alphabet felt book for her. I am now up to F. I keep saying that I better get more done or she will get to kindergarten and only know a-f. Yours is so darling. I love all of the little details. I do not like hand sewing, so mine is done with as much machine as possible. I may have to steal your lion idea for L!! That is my favorite!! Gah! The cuteness is just too much. I so wish I had the time to make one of these. This is just precious! Great job! I love the lion. Would you mind sharing your pattern? Cassey–I didn’t actually use a pattern… I just kind of sketched something on a piece of paper, then cut it out and traced around it on the felt. I’d LOVE to figure out how to MAKE a pattern so I could share it. I’m just not very familiar with how to do that sort of thing. If I figure it out though, I promise to post it here! I just recently finished a quiet book for my granddaughter. It was so much fun! I learned a cool trick to trace an image you like from somewhere or draw one onto a piece of freezer paper. 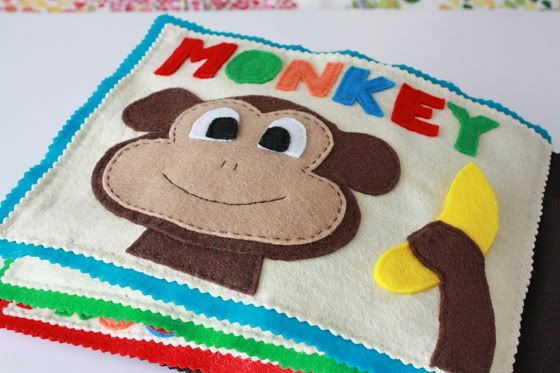 Iron the paper, waxy side down onto your felt or fabric and cut it out…the paper then easily peels off! Works great. Your book is adorable! Wow! What a great solution! Thank you so much for sharing! 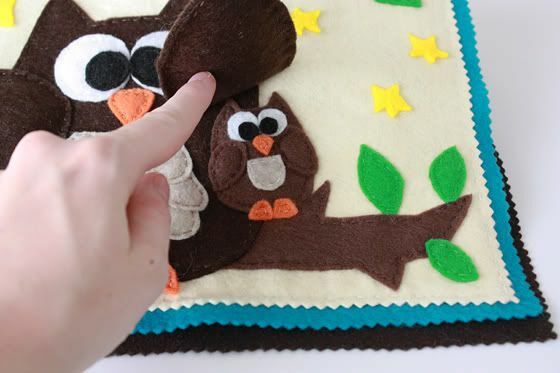 What did you use to trace it onto the felt? Fabric pencil? Yep! Worked like a charm! Ok, YOU ARE AMAZING. I WISH MY KIDS HAD YOU FOR A MOM. THAT BOOK IS THE CUTEST THING EVER. Emily, that is a true work of art. I wish I loved to sew felt by hand!!! I’m a huge fan of the lion, but they are all super cute. Wow Emily, you are so talented! You did such a good job, I wish I could make such a cute book. I think all the pages are amazing but I like the lion one because of the gorgeous colors. I’m in love, I’m in love, and I DON’T care who knows it!! Luke LOVES his book, and I kind of love the shooting knives of jealousy I get at church 🙂 That owl nearly brought me to tears. It is SO so SOOO cute!! Well done. Your kids are the luckiest. PS I didn’t really experience the third trimester sobbies until about 2 days before Luke was born. Tyler broke his phone (by biting his phone) and I bawled for a good two hours. It wasn’t even my phone. It was the weirdest feeling ever. So out of control.. This is without doubt the most stunning quiet book I have ever seen! You can see the love that went into its creation in every page. We are going to start trying for a baby towards the end of this year and this is exactly the type of thing I hope to create for when our own little one eventually comes along. Naomi–Thank you so much. You’re so sweet. Congratulations on the upcoming marriage! I wish you ALL the best in the wedding and family after! de-lurking to say WOW. I see that you don’t have a pattern but I love it and if you don’t mind I am going to steal the idea. Thanks for inspiration today and all the other days I’ve read your creative posts! How did you find was the best way to bind the pages together? Some of the animals are stuffed, but did you put stuffing in all of them? 1. I use regular plain ol’ soft felt rather than the stiffened kind. For the cream-colored background felt, I used wool felt, like they sell on bolts at Jo-Anns. It’s slightly higher quality and a bit sturdier. If you like, you can use that for all your felt. I only used it for the cream backgrounds. Almost all the other felt is just from the little sheets they sell pre-cut that are made from recycled bottles. 3. I didn’t stuff all the animals. I did anytime I wanted a little extra texture, but most things I wanted to remain flat (i.e. the fish bowl water, the alligator, the branches behind the owls). I’ve found if you stuff everything the book can get REALLY fat really fast, but if you just choose a few things to stuff, it stays manageable. -what are the sizes of your pages? -On the owl wing and banana did you do a seam around the edge that flaps ? (would it make it more stable? 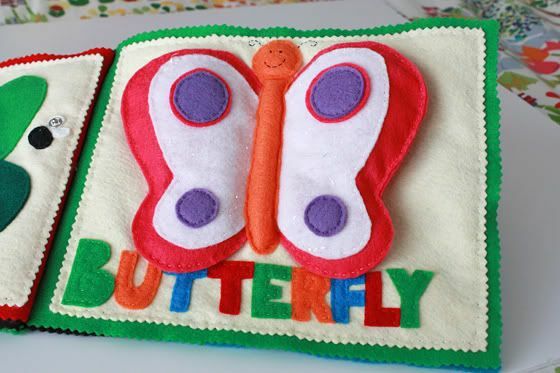 -when sewing the cream pages to the colored felt how did you do both sides? Was it all three at once? Sorry I am the worst and I can’t find your email address and when we switched cell carriers apparently I lost your number. Please forgive me 🙂 I hope you are well and thanks so much for the idea and all the help with my gazillion questions! Shelley- sorry it took me a while to respond! 1. I used the colored sheets you can buy pre-cut to use for sizing. Then I cut the cream-colored background sheets down to leave about a 1/2″ border for the colored sheet to show through. Not very scientific, but there you go. 2. I have used a basic all-purpose thread. I asked the lady at the sewing counter what she thought, and she told me it really wouldn’t make much difference whether I used a polyester or cotton thread. Some of the colors I have are polyester and some are a cotton blend. I haven’t noticed a difference in how well they hold up and all of them seem to be easy to sew with. 3. 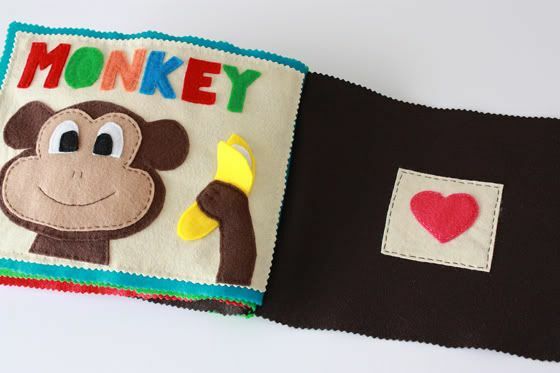 I did sew a little seam at the fold of where the banana folds but didn’t do one around the top border of the peel. You can kind of see in the picture. The owl wing was stuffed, so I made it separate from the rest of the owl’s body and then attached it once it was stuffed with a seam. Let me know if that doesn’t make sense. 4. When attaching the cream colored sheets to the colored backgrounds, I pinned them onto the colored sheet so they matched up as well as possible. Then I sewed the whole sandwich (cream sheet, colored sheet, cream sheet) together all at the same time. I’ve found it’s easier to get a neat stitch this way. I just love the quiet book. You did a marvelous job! About crying over movies, I do that to, but I’m not pregnant. lol You are just going through some changes, and it will pass. i LOVE it all!! i wish i’d had one of those for my girls…or even still!! alas….i am soooo not as creative as you are! you have one lucky little lady to have you as a mama!!! This book is so, so lovely!! 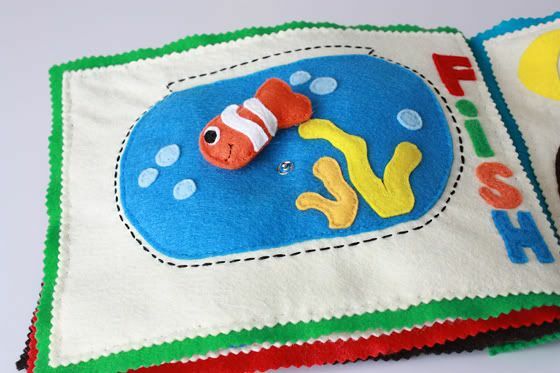 Your baby will absolutely love this. Great job! Joni- Thanks! I can’t wait to see what you come up with! 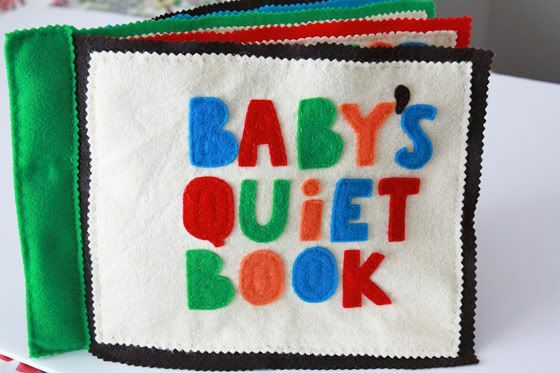 This is one of my favorite quiet books that I have ever seen – and I’ve made a few! Thanks for sharing your ideas. Your quiet book is really beautiful. Congrats on the little one. I’ve never blushed so hard in my entire life! I DIE over everything adorable on your blog all the time. Thank you for the compliment! What a super book! The lion has to be my favourite… what a collection of great colour! But the owls are very sweet, too. 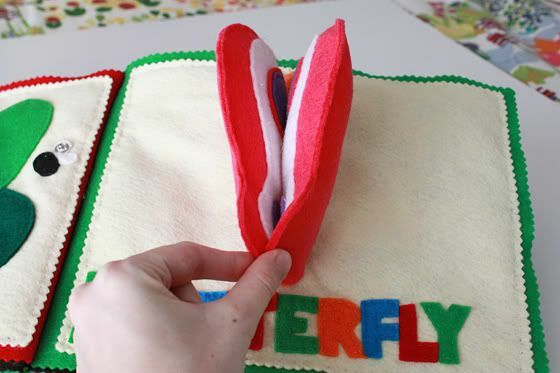 I made a felt book for my daughter’s first birthday (today! ), and she loved it — well worth all those (Neflix-watching hours! )… I’m sure your little girl will get so much joy from this one, too! That is just so cute and so well made!! Congrats!!! 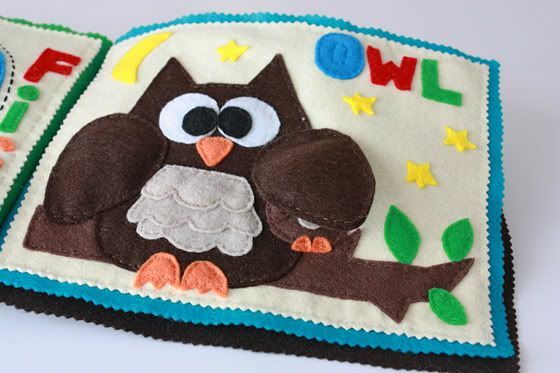 I would love to buy one of these felt books for my grandbaby. Can you tell me how to get one and how much they are? Dawn, thank you! You’re so sweet. I actually hand-made it from a pattern I made up. I don’t sell them, but if you’re looking to purchase a quiet book pattern, Etsy is a great resource. I’d try this shop, or this one. I’m with you, LOVE that owl! YOU should sell these on Etsy. I would totally buy one. I am so impressed. I found this through Pinterest. Sorry I meant to ask…how many hours do you think you spent on this? Mari–Thanks for the compliment! Because I hand-sewed it, it took much longer than it would have if I’d done it with a machine, but I’d say it was close to 20 hours. That’s with cutting, piecing, and hand-stitching. Definitely a labor of love, but it was worth it. With a machine, you could complete the sewing in much less time. Nicole, I’m so sorry, I don’t have a pattern! I just drew things on paper, cut them out as templates, and traced them onto the felt. I don’t really know how to make a pattern, but I’ve had several requests. If I get it figured out, I’ll email you! 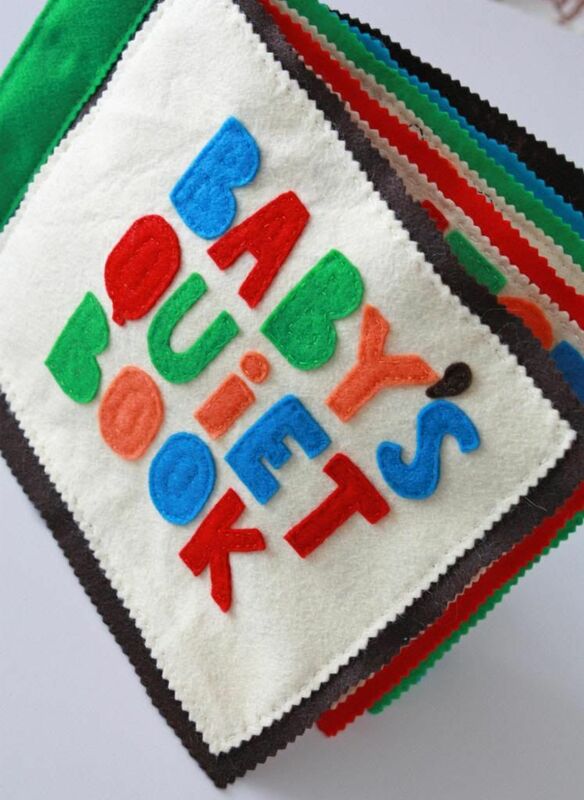 I’ve been doing a lot of research on quiet books, as I am making one for my friend who is expecting her first baby. This is by far my favorite! You are so talented. Here is a ridiculous question for you…Did you wash all of the felt before you use it? I thought about washing everything before I sew it since it will more than likely end up in baby’s mouth 🙂 but then I wonder if the felt will handle that very well. Just thought I’d get your thoughts. Thanks!! 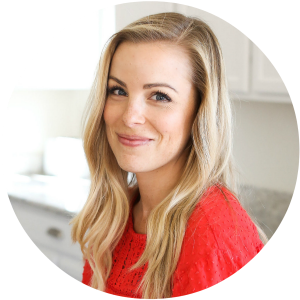 Brianne–thank you! You’re too sweet. I didn’t wash it beforehand…I thought about it for the same reason you described, but I didn’t pre-wash it. If you do, I’d love to know how it goes! Best of luck! LOVE this book!!! Did you use any patterns? If so, where can I get them?? If not, please wish me luck!! Chrissy–I didn’t use any patterns… I just made it up as I went and sometimes cut things out of paper to trace onto the felt, though I free-handed a lot of it. I wish you the VERY best of luck!!! I loved your Quiet Book and wanted to use some of your ideas but ran out of time and gumption. I have referred my readers to your blog for ideas. Love this quiet book! I have a few friends that are having babies so I thought this would be agreat gift. I am doing some of the same aniimals as you, but I added or changed a few as well. I was just wondering, how did you sew the lion to the tan felt? I’m having trouble with that?? 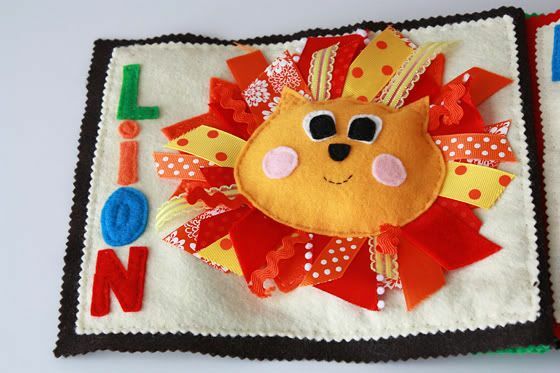 Kate- I actually cut out the lion face and did all the face embroidery, and cut out all the ribbon strips. First, I sewed all the ribbon to the background, then when it was all secured, I attached the lion face over the ribbons, sewing it all the way through the ribbon and the background page. Does that make sense? Hope that helps! Have you ever used the stick it felt shapes you can buy? I was wondering how they would hold up? I thought it might save a little time in cutting out letters and numbers. Great job! Love the pictues! Delores- I haven’t actually used them before. I bet they’d be easy for sure, but I’d be concerned about how well they’d hold up. Let me know if you give them a try! I’d love to know how they turn out. Probably no surprise to anyone, but the best way we’ve ever put together busy books is to get a group of interested people together with the patterns. Each person chooses one (or two!) pages and “assembly line” sews them for the number of people in the group. 10 people? Make 10 pages! Then get back together and exchange pages. It’s loads easier to make 10 of one page, then try to do each page by yourself and it’s less time-intensive as well. My kids are all grown and their busy books in storage, so now I need to get some other grandmothers to do it with me! 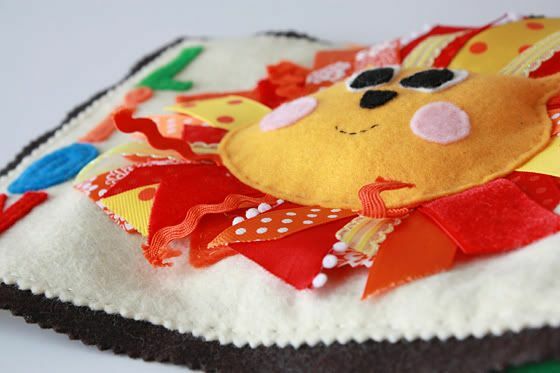 I would recommend sewing two felt pieces together with sturdy stabilizer – felt will stretch on it’s own, especially with little hands pulling them on / off pages. Best wishes! great job!!! i dont think you’re crazy. it is very relaxing! 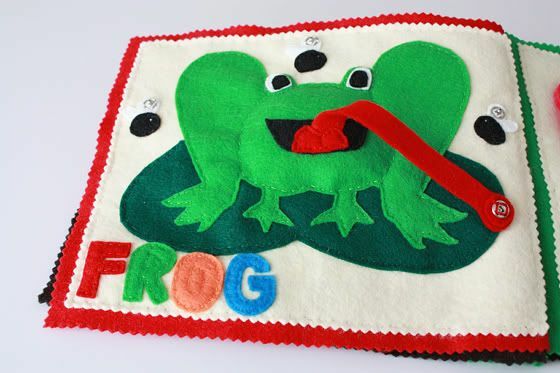 The frog is my favorite, great ideas! I found this on Pinterest and it is just sooo adorable! I love it. I love quiet books in general, but I think this is one of my favorites so far; it’s so simple and inspiring. I have to say, I’m crazy like you: I really enjoying hand sewing with felt as well. It is very satisfying. Good work! I’m sure your baby adores it! So cute! You did a great job. I will add this to the queue of things to make for my girls. I love hand sewing felt, too! I made one of those card table playhouses and some felt food but this looks like a fun project for my littlest one! I am in LOVE with this quiet book. I have an 11 month old and he LOVES animals. If you have a pattern you would be willing to share I would love it! I love your quiet book! I want to make one for my grand daughter Olivia for Christmas this year. My thought is to start simple because she is just about a year old and then each year add a few more pages. Would you share how you bound your book? Thanks so much for sharing your wonderful ideas. I loved the lion! This has got to be the cutest book I have ever seen! I have to make one for my granddaughter! As for where to find animal patterns, I have always found coloring books to be a great place to look! Hi there I adore this quiet book of yours! I can see how much effort your put into this. I don’t have a sewing machine so it’s good to know I can still make something like this without one. JUst a question about sewing though – what kind of stitch did you use? Just in and out straight down the line, or did you loop back while doing the in-and-out? Sorry I don’t know the proper terms so hopefully you understand what I mean. Thanks! I know just what you mean! I just used a simple, straight-forward in and out stitch. Nothing fancy. Very best of luck! Melody: I’ve had some difficulty with velcro too… one suggestion is to use an embroidery needle (which is thicker, stronger, etc.). That’s what I did, but if you’d rather not and you do have a machine, you can use a machine to sew it on. Otherwise, they sell stick-on velcro, which might save you the hassle. Best of luck!!! How about using a glue gun? That’s worked for me. I used soft velcro for some trousers for a baby. It can be sewn by machine quite easily and isn’t scratchy like the tougher velcro. do you have pattern for this book? Jody – sorry, no! I just traced on felt and cut things out freehand. Ok. That’s awesome and my tiny girl needs one!!! I am presently making a quiet book for one of my grandchildren. Thank you for the inspiration and creative idea! This book is beautiful! I love it! I know what you mean about hand sewing felt. I feel the same way. I’ve made my kids lots of little stuffed animals out of felt and for some reason, I don’t get the same sense of peace and accomplishment when I use a machine. Plus, trying to sew the little details on my machine is a headache for me, so I’d rather just sew it by hand. This book is great though. Kudos. This book is wonderful! Babies will love it. 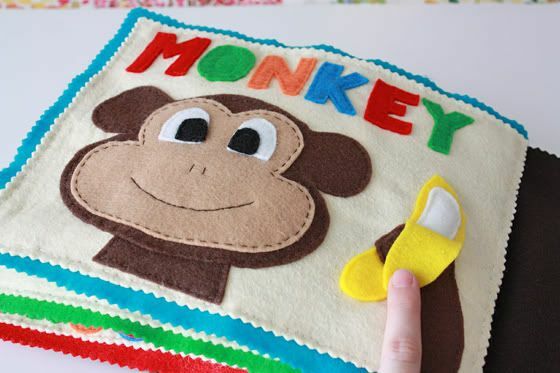 For older children, the letters can be snapped or velcroed on to learn spelling and reading . What’s the approximate size of each page? What are the dimensions of the cover and back of the book? P.S. Looks great!!!! Amanda – I just used 8×10 or 8×11 sheets that they sell in craft and fabric stores, so that’s the basic size. The cover was the same. Best of luck! Kendall – I used pinking shears. There are all grades of pinking shears, but mine weren’t too expensive. You can usually find them at Michaels, Jo Ann Fabric, and Hobby Lobby. Best of luck! I have used a glue gun to attach Velcro and little felt decorations that I didn’t want to sew. I have also used cutesy fabric that I had on hand and put felt on the back of it. This is great!!! How did you bind the book when you were done? Joy – Here’s what I wrote to another reader with the same question. Hope it helps! Emily! I totally love this…and I don’t even have kids! I know I want to make this when one of my sisters/cousins has a baby. I think I’ll even make one ahead of time for my future kids. I just love how each page has something special about it. Great discovery for kids. Also, the felt makes it pretty durable. Great idea and awesome designs! Thanks so much! We’ve loved it and it’s sill going strong! 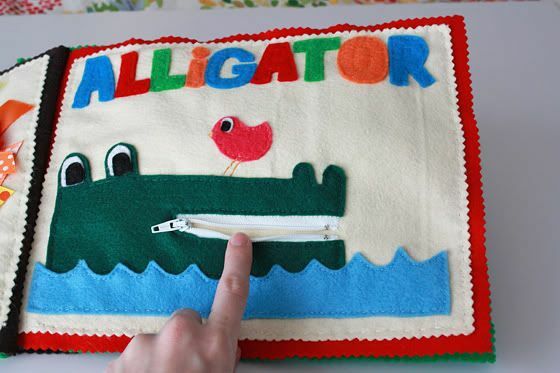 Looking at this wonderful book idea again and wondering what you used to cut the squiggle edges? Did you use some kind of pinking shears? Emily – Yes! I just picked up a pair of pinking shears at my fabric store. They’re nothing fancy, but I loved the finish they gave the pages! 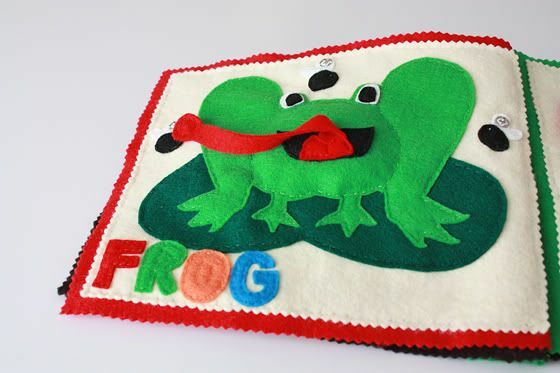 Do the flies come off the page and snap to the frogs tongue? How did you make that page? Dorothy – The flies are sewn onto the page, with little snaps on their wings. The tongue is the part that moves from fly to fly (also with a little snap on the end). Does that make sense? Let me know if you have any questions! Happy to help! Love love love this book. I’m starting to do one for my son and I’m very jealous of your skills. I have a question, what did you use as stuffing? I only stuffed a few things (like the frog’s legs), but I used just regular batting (you can find cotton or synthetic blends at nearly any fabric or craft store). Hope that helps! this is wonderful! thumbs-up, mommy! Beautiful book and beautiful handcraft work! I did make a similar book after being inspired by you. My pinking shears dulled after cutting a couple pages and did not work. When I went to purchase another one, the directions indicated felt is the worst thing to cut with a pinking shears. I also asked the advice of the individual cutting fabric at Jo-Ann’s and they repeated the sentiment. So reluctantly, I restarted and did my project with all straight edges. How did you accomplish your entire book with a pinking shears. Did you do anything special to keep it from doing that? Any advice is appreciated, I really prefer the “pinked” edges. I did notice some dulling, but I had a friend suggest cutting a piece of foil in-between every few pages. Not sure whether it was a placebo effect, but it got me through making a few books! Hope that helps! This is just brilliant. Love it! So sorry! There’s no pattern. I’ve never quite figured out how to make one! Do you sell these? They are awesome!!!! Dana – Thank you! I don’t sell them, but I really should! These are so so adorable!! Do you have a pattern that I can recreate for a gift for a friend? Would you be willing to share it with yours truly? Hetal – Thank you! Unfortunately, I don’t have a pattern. I drew outlines on pieces of paper and cut them out of felt. Best of luck to you! I was not blessed with the skill to sew by hand or otherwise. Would you consider selling one? Did you sew the zip? I am not so good at sewing , but think it is a great idea. Do let me know. Thanks!! Carita – Congratulations on finishing! Also, I LOVE the idea of incorporating multiple languages. Well done! I made one of these for my nephew. The pages turned out adorable, however, when I went to manually stitch the cream pages onto the colored felt my stitches look great on one side, but horrible on the other. Did you encounter this at all? Did you manually stitch them together or use sewing machine? Thank you for replying so quickly! After I noticed and did keep a close eye on it, the other side did look better. I am afraid if I were to stitch using a sewing machine they would look even worse! LOL! Amy – I hear that! Machine sewing is not my natural gift–ha! Merry Christmas to you!!! 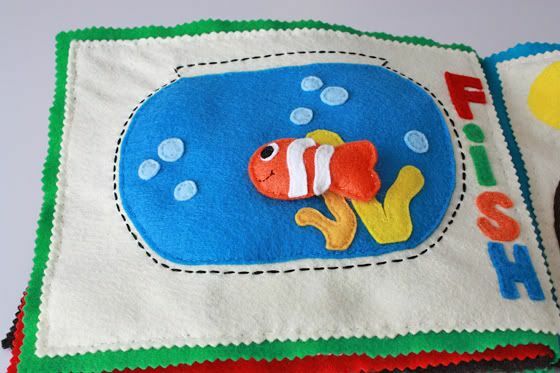 Except for the fish page, this looks like it could be used with those < 12 months! Omg this is adorable! Do you sell these? If not you should open an Etsy shop!! That’s so nice of you! Thank you! I don’t sell them yet, but maybe someday! Love all of these! (Especially the owl, alligator and fish!!) I want to make a book for my grandson and this has definitely inspired me – thank you for sharing yours!!! Oh, that’s so nice of you to say! Thank you! I hope yours turns out beautifully! I don’t have a sowing machine but I can sew. How long do you thing it’s going to take if I do it by hand? It totally depends on your speed. I made mine almost entirely by hand and it took me 10-12 hours (as a beginner). I hope that helps!